High School Hikers (HSH) provides a program for high school students to experience the many different aspects of environmental protection, perpetuation, and advocacy. By doing so we give them the tools with which they may best decide how to malama (cherish) Hawai‘i’s spectacular natural resources. 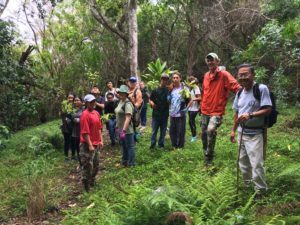 We support hiking activities in various high schools in the State of Hawaii with HSH/Sierra Club approved leaders working in cooperation with a high school advisors to provide leadership knowledgeable in hiking skills and environmental subjects. High School Hikers Program is an activity section of the Sierra Club, Hawaii Chapter.